As the most powerful console ever, the new Xbox One X from Microsoft not only offers immersive 4K gaming experience, but also boasts improved video decoding compared to the older Xbox One S consoles. It now even supports 4K 60Hz HEVC (H.265), VP9 and AVC (H.264) video formats. Have some MKV files ripped from disc media or downloaded from online video streaming sites, how about playing MKV files on Xbox One X? From above lists, we can see that the new Xbox One X will fail to handle MKV file encoded with the video codec such as MPEG-1, Real Video, MVC or audio codec like FLAC, ALAC. To play MKV file on Xbox One X with above listed incompatible video and audio codec, you will definitely need to perform a codec transcoding process. 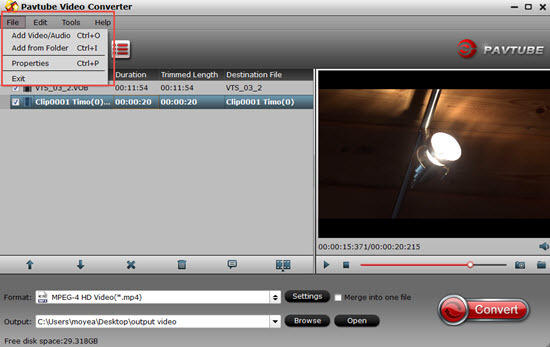 Here, you can get the job easily completed by downloading Pavtube Video Converter. The program has full importing support for all the MKV files encoded with the incompatible video and audio codec listed above. Thanks to its batch conversion mode, you can load multiple MKV files into the application for conversion at one time. With the program, you can efficiently transcode MKV files to Xbox One X playable video and audio codec listed above with perfect quality and super fast encoding speed. 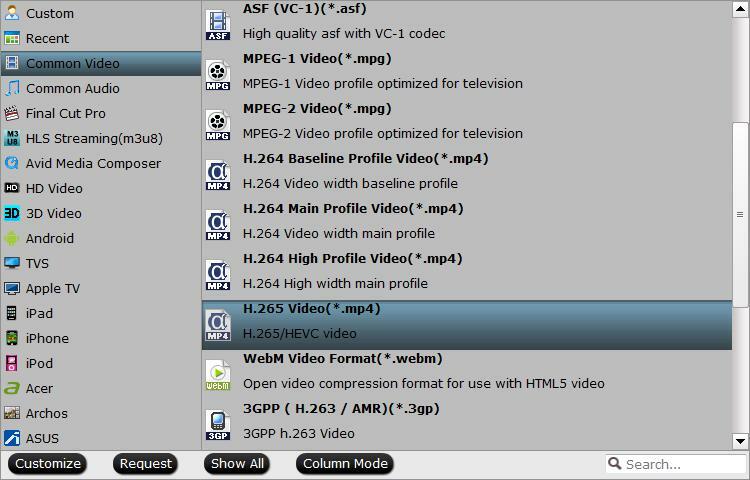 If you plan to encode MKV file to H.264/H.265 codec, the program can offer super-fast encoding speed for those 2 codecs thanks to its hardware-encoding acceleration. You can get up to 6x H.264 codec encoding speed as long as you run your computer on Graphic cards that supports Nvidia CUDA or AMD App technology or up to 30x faster H.265 codec encoding speed as long as you run your computer o Maxwell (GM206) or Pascal based Graphic cards that supports Nvidia NVENC technology. After the successful installation, click “File” > “Add Video/Audio” or “Add from Folder” to load unsupported MKV files into the program. Click “Format” bar, from its drop-down options, if you own a 4K TV, just select one of Xbox One X supported 4K file formats such as “H.265 Video(*mp4)” from “Common Video” main category. If you own a HD TV, just choose one of Xbox One X playable HD file formats such as “H.264 HD Video(*.mp4)” under “HD Video” main category. 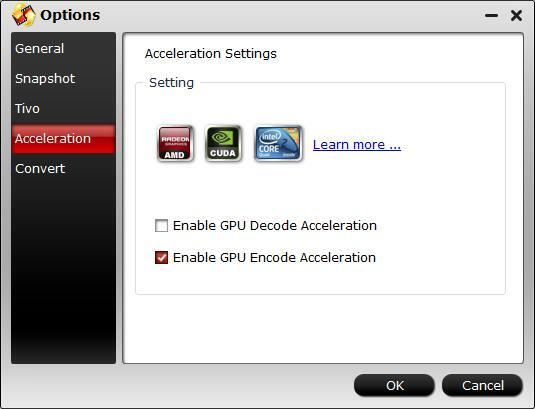 Click “Tools” > “Options”, in the opened “Options” window, click “Acceleration” menu, then check “Enable GPU Encode Acceleration” otpion so that the program will accelerate converion speed when encoding MKV to H.265/HEVC codec. Press the “Convert” button in the right-bottom to begin the conversion from MKV file to Xbox One X readable 4K or HD file formats conversion process. After the conversion is completed, you can either play converted video on Xbox One X from USB drive or stream video to Xbox One X via Plex.